Louvers on the south facade shade the interior during the summer and provide privacy. Flexibility is integral in the design of LEAFHouse. The spaces can expand based on the changing needs of the homeowner. The house can be reconfigured from day to day, seasonally, or over a period of years. Moveable translucent panels, when closed, create intimate, private spaces. They can also be opened up in a variety of ways, to make room for entertaining, houseguests, or simply to enjoy the surprisingly spacious feel of the house. This flexibility extends to the exterior as well. Large sliding glass doors open up the south living room wall of the house to the deck and surrounding landscape. Cabinets and flexible walls allow the space to change. 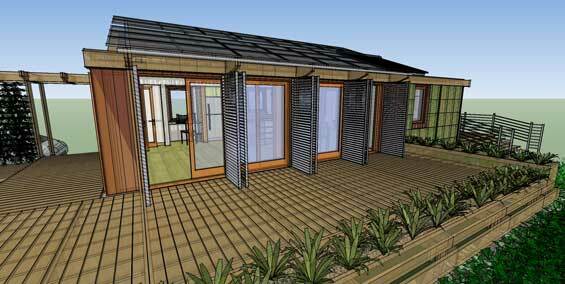 At a detail scale, the house design includes many transformable features that enhance flexibility. Interior walls double as tall pullout storage cabinets, a Murphy bed folds into the wall, and a nesting dining room table allows for expansion for those big dinner parties. The house design is also adaptable at the scale of the community. LEAFHouse is designed to be extended into expanded models and communities, by adding modules or combining units into larger building types. These various models and communities encompass a variety of densities and lifestyles from apartment complexes to single family homes. A classic Murphy bed allows the bedroom to become part of the living room. Visit LEAFHouse Communities to see further examples of our design's flexibility.